We asked people from all over the UK to join us on our adventure to give us their local knowledge and help take the wind. We knew that was a big ask as the seemingly random route between The Climbs didn’t make the logistics easy at all. But well over 100 people answered our call over the month and joined us for a least a day, at their own expense and in all weathers. In fact there was only three days when it was just the three of us. 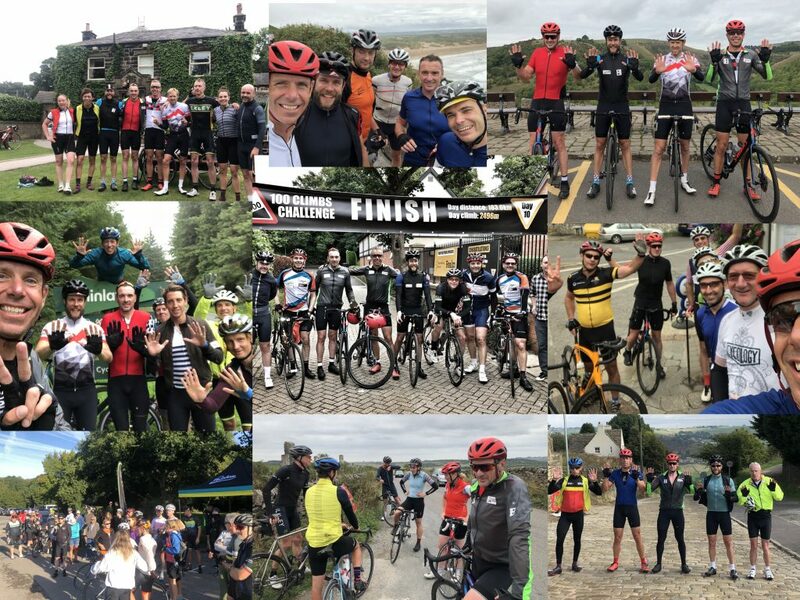 We’re incredibly grateful to every single one of them for taking the time out, travelling huge distances to join us and for making our journey that little bit easier and more enjoyable because of it. Thanks to everyone. Chapeaux. We don’t want to single anyone out as everyone who joined us is a hero in our eyes. The effort, commitment and sacrifices made to come and join our little peloton was simply remarkable. Not only did you protect us from the wind, you entertained us, distracted us, listened patiently to our occasional moans and pretended to laugh at Doms jokes – even his Tarka the otter one! But having said we don’t want to single anyone out, it is worth mentioning a few people as an example of the support we received. We have to start with Mike Shute. Mike joined us for two stints, 9 days in total. A whippet up the hills and a great rider. Oh to be young again. Good luck with your new career Mike. Mark Disney. A solid stint of the first 5 days of our challenge. Mark helped us kick the whole thing off when we were still very apprehensive about whether the challenge was possible. We still smile at the story of the cattle grid on Porlock Hill. Jonathan Martyr: Jonathan joined us in Tavistock for a couple of days tackling his local Devon hills. They certainly make the hills steep down your way Jonny. David Meyrick: We met David in Wales. He rode out early one morning to join us as we were about to ride up the Tumble and shared his local knowledge to improve our route for the day. We then met David again on two separate occasions as we cycled around the country as he was on his mission to join the 100 climbs club. Congratulations David, by our calcs you are member number 24. Andrew Davies: Andrew joined in Bath and spent a lot of the next two days sat in the wind as we worked our way into Wales towards his home town. Strong work Andrew! Tim Mcintosh, Giles Roberts and Nigel Panton: Two of the toughest days from Hawes to Penrith for these guys. Neither cramp nor tumbles could stop these guys – chapeau. David Johnston: David also chose one of the worse days possible to join us as we battled the biblically grim weather into Dornie in NW Scotland and then stayed with us to Inverness before joining for the last day. Simply the best person to tuck in behind. The Scottish Crew. Steve White travelled by plane and train from The Alps in France and together with Rachel Hull, Alan Graham and Rob Farmer joined our little merry crew all the way from Dornie to Perth with Chris Adams adding to the team from Inverness. Huge effort guys and thanks for bringing some sunshine. Chris Hogg and Chris Craig: After joining us for the massive day in the Lake District, the two Chris’s showed us their local roads from Otterburn to Darlington. We were running on fumes by that stage and really appreciated the help on a windy day – much appreciated. Anthony Tugwell: Tugs joined us from Darlington and spent more than his fair share of the time in the wind. Tugs by name and a tugboat by nature – very strong work fella. Ben Moore and Mark Mason: Ben and Mark were huge supporters on social media but when they joined us for a day from Llangollen they arrived in specially designed shirts printed up with the climbing profile of the day. Not only did they look good but they rode well too.